The idea they voted on was the main cast, as Dungeons and Dragons characters. Whip is a little dragon of course, then we have a dwarf, cleric, thief and warrior. And, naturally, meta-gaming. 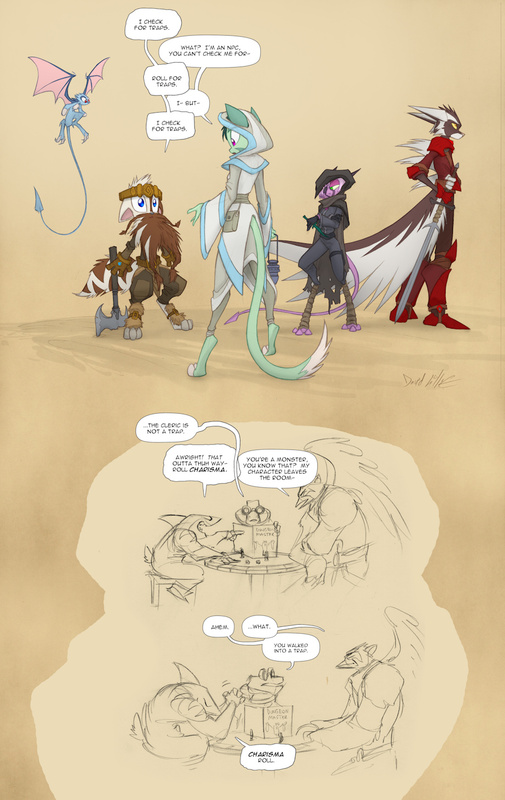 The Igrath / Grunn / Scinter rp session was inspired by their scene around the table in Volume 2. http://www.dreamkeeperscomic.com/GNSaga.php?pg=102 I hope you enjoy, and Happy Thanksgiving! So he's checking out the cute kitty cleric...for traps. So he's checking out the cute kitty cleric...for traps. Riiiiiiiight. I have been inspired to create a new NPC with which to torment my PCs. "How do you check a cleric for traps?" "Braille."